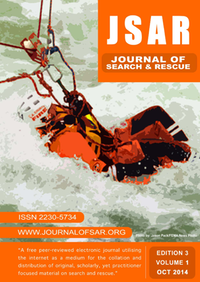 The Journal of Search and Rescue is a free peer-reviewed electronic journal utilizing the Internet as a medium for the collation and distribution of original scholarly material on search and rescue. 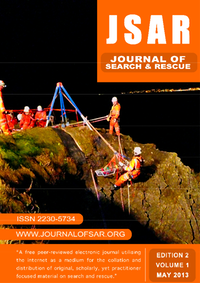 There is currently a lack of a dedicated journal serving those with a direct interest in all disciplines of search and rescue including: rope rescue, water (flat, swift and marine), ice rescue, wilderness search and rescue, structural collapse rescue, trench collapse rescue, cave rescue, dive rescue, motor vehicle extrication, canine search, technical animal rescue, air rescue and mines rescue. 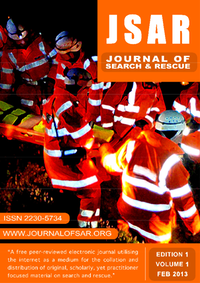 Article submissions from other search and rescue disciplines are welcome. Robin Blandford, Keith Gillespie, Steve Glassey, Kay Goss, Daniel Graham, Ian Greatbatch, Valerie Ingham, Robert Koester, David Johnson, Cortez Lawrence, Ian Manock, Mike Rose, Brett C. Stofel, & Wayne Severn.